Canadians can now apply or nominate someone for a Senate appointment year round. Since Confederation in 1867, Canadian Senators have always been appointed by the Governor General on the advice of the Prime Minister, a process that remains the case today. However, Prime Minister Justin Trudeau now makes his own recommendations following an open, arm’s length and merit-based nomination process. The Senate was conceived by Canada’s founders as an appointed chamber of Parliament that would perform functions — such as legislative review — in a complementary manner to the elected House of Commons. Because they were to be appointed, Senators would be further removed from the partisan political arena than their popularly elected counterparts, allowing for calm consideration of legislation within a less partisan context. The goal was for a Senate focused on sober second thought that represents the voices of regional and minority interests in Canada. However, over the course of its history, the Senate has faced criticism as a receptacle for patronage, for behaving in an excessively partisan manner and for having its deliberations interfered with by the executive (including the Prime Minister’s Office). These characterizations hampered the Senate from fulfilling its intended role and further undermined it with the public. In December 2015, the current Government announced a new arm’s length body to advise the Prime Minister on Senate appointments. Accordingly, the Government established an independent advisory board with a mandate to provide merit-based recommendations for Senate appointments. The aim is to foster a less partisan Senate that is more independent and better tooled to fulfill its crucial role as a complementary partner to the House of Commons. Potential Senators will be considered with a goal of achieving gender balance in the Senate, with a priority given to those who represent Indigenous, minority and ethnic communities. Although past political activities do not disqualify an individual, applicants must demonstrate an ability to bring independent and nonpartisan perspectives to the Senate. 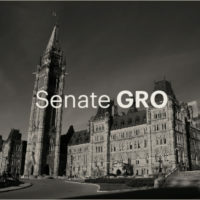 Potential Senators are expected to be knowledgeable about the legislative process and the Canadian Constitution, including the Senate’s role as a complementary chamber of sober second thought, regional representation and minority representation. Ethics and integrity will be considered as part of a potential Senator’s ability to serve. Nominees must possess one of the following: significant experience in the legislative process and public service, recognized record of community service, or leadership and achievement in a profession or field of expertise. They must be at least 30 years old, and no older than 75 (the mandatory retirement age for Senators). They must be a resident of the province they are appointed to represent. They must own property with a value of $4,000 in the province they are appointed to represent. The advisory board is responsible for providing a non-binding shortlist of potential Senators to the Prime Minister. *Senators from Quebec are appointed to represent a specific electoral division. These Senators must meet property qualification in their own electoral division or be residents in that electoral division.